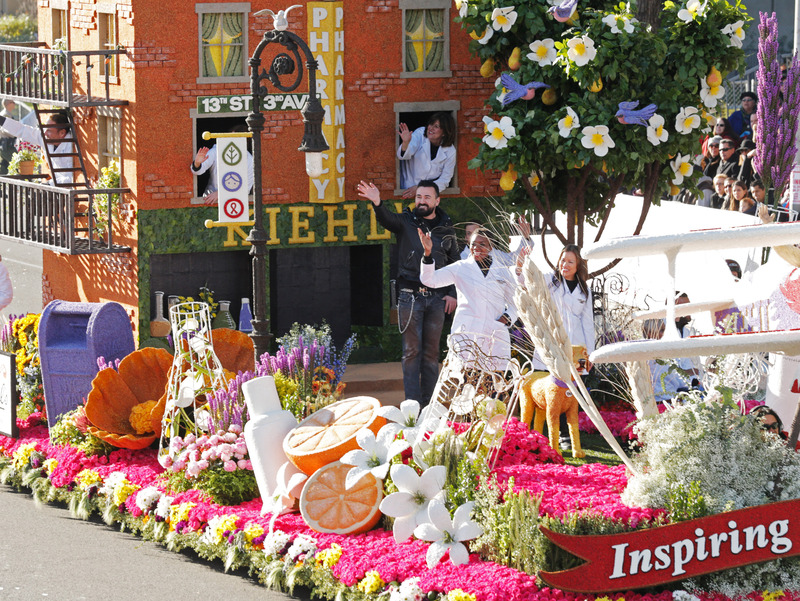 You may just want to be literally consumed by the aromatherapeutic cacophony of naturally beautiful botanical ingredients that both make up Kiehl’s lovely skin care products, and will be represented on their Tournament of Roses Parade Float this Thursday, January 1st, 2015, New Year’s Day. From pears to pink roses, carrots, winterberries, coconut flakes and more, Kiehl’s original New York apothecary (still open to the public in the East Village) will be represented in full bodacious bloom as their float takes to the streets of Pasadena. Botanical ingredients used in many of Kiehl’s products sold today, are featured throughout the float. The Kiehl’s brick-sided store is created in colorful dehydrated carrot with creamy white sesame seed trim and manzanita leaf roof. Wrought-iron features on fire escapes, lamp-post and fences are decorated in black seaweed and dark gray poppy seeds. Blue sinuata statice petals adorn the mail box with vibrant red winterberries used to create the fire hydrant. The bi-plane is artistically created in crisp white coconut flakes, blue sinuata statice and red carnations. Clouds of Party-Time gypsophila billow from beneath the plane. Sculptured botanicals have been artistically created in a variety of materials and textures including yellow, gold and red strawflower petals, white coconut flakes and sweet rice, orange and peach lentils with pink sinuata static petals. The centers of the sunflowers are solid orange roses and stems of lavender have been made from hundreds of purple liatris. The beaker outlines are covered in sweet rice powder overflowing in vibrant floral “ingredients”. Fifteen thousand hot pink roses flow through colorful summer gardens created from peony, delphinium, gerbera, bells of Ireland, lilies, sunflowers, larkspur, tulips and spray roses. An edge of creamy cornhusk frames the float. The first ever beauty company to appear in the parade in 30 years, Kiehl’s embodies their theme “Inspiring a Beautiful World” inside and out, each and every day, not just by the finest & most luscious skin care that they provide to their patrons, and their simple, efficient, recyclable packaging, but also through their community efforts and three philanthropic endeavors: AIDS/HIV prevention, research and education; protecting and nurturing the environment and children’s well-being. Symbols of these philanthropic commitments will be seen on the float and will be embodied by two people in particular who will portray this year’s parade theme of “Inspired Stories,” Timothy Brown and Evan Dumas, riding in vintage sidecar motorcycles as part of Kielh’s float; yet, another first for the parade. Timothy Brown is miraculously the first person in the world to have ever been cured of HIV. Eleven doctors treated him successfully with anti-retroviral therapy after he was diagnosed in 1995 while attending school in Berlin. Arguably one of the most fascinating and followed stories in the realm of HIV research and science, Timothy has continued to broaden its reach and effect by becoming a leading advocate for further research for a cure for everyone everywhere, and for the rights of people living with HIV and AIDS around the world. Timothy gives hope to millions. Seventeen-year-old Evan Dumas, of Culver City Unified School District, will be representing Kiehl’s commitment to improving the environment through Recycle Across America, a not-for-profit organization dedicated to simplifying the act of recycling for the general public in order help them recycle more and correctly. Recycle Across America introduced the first and only society-wide standardized labels for recycling bins, which are proving to be the #1 solution that helps people recycle more and helps people recycle right! Because let’s face it. Incorrect recycling efforts only prove to be futile. 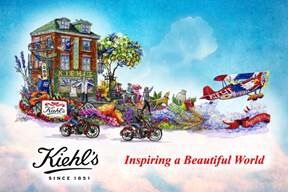 A first for the 126 year history of the parade, Kiehl’s is honored to be the first company to ever have motorcycles riding along side a float. But, it’s not just a fun gimmick, it serves symbolic to Kiehl’s “spirt of adventure” and will act as an honoring call-out to the brands original and current president, Chris Salgardo, an avid rider, and former president, Aaron Morse, who had his own extensive motorcycle collection in the 1950s and is responsible for the idea of featuring a motorcycle in each of the Kiehl’s stores. Real men deserve supple skin too, right? And, what a way to draw them in! Be on the look out for the big whigs of Kiehl’s with big hearts, riding prime on their Tournament of the Roses float: Kiehl’s President, Chris Salgardo, Kiehl’s Senior Vice President of Global Communications, Rob Imig, and eight of Kiehl’s West Coast Kiehl’s Customer Representatives. It’s sure to be a botanical and meaningful ride of a life time! The Pasadena Tournament of Roses Association, a non-profit organization that produces the annual Rose Parade, consists of 935 volunteers who spend over 80,000 combined hours each year to plan “America’s New Year Celebration”. In its 126th year, the Rose Parade is the ultimate celebration: a festival of flowers, music and equestrians unequaled anywhere in the world. Televised worldwide in over 120 countries, the Parade reaches over 47 million viewers in the U.S. and 28 million viewers internationally every year. Hundreds of thousands of spectators watch the parade in person across the parade route.